I drew the cover for the first Tinyville Town book today, called “Gets to Work!” It’ll be published in about a year by Abrams/Appleseed. More info here as we go through time together. Tinyville Town Timelapse from Brian Biggs on Vimeo. Hey how ya doin? It’s been a while, hasn’t it? My gosh has it been since May that I last posted? Well shoot. In all honesty it’s been a pretty slow summer, workwise. I completed the third Everything Goes picture book back in the Spring, the final two Everything Goes board books in July, a couple of other outstanding book projects that I’ve had hanging around (which I’ll post about later), and some non-book illustration work got done also in July. I have a huge series that the great Jon Scieszka is writing that I’ll be spending the next couple of years illustrating, but Jon isn’t done writing the first one yet so until then it’s kind of sllooowwww. Nevertheless, the fun never stops. I was in Adamstown, PA two days ago at Renninger’s Flea Market. I love flea markets because I love to have strange and useless things, discarded by others, sitting around my home and studio. Mostly records, maps, little figurines, toys… This trip I went looking for ideas and inspiration. Somewhat related to the information in that first paragraph, I’ve been creatively a little slow this last several months, and I’m looking for things to get me excited about making images again. Everything Goes really took a lot out of me this last four years, and other than the Scieszka project, I really don’t know what I want to do next. I have a few picture book manuscripts that I’ve got at various levels of readiness, a list of “good ideas,” some thoughts on designing puzzles and toys but no idea what to do with them, and nothing that has my gears turning. I recently procured that gigantic Taschen book about Magic with posters and photos of magicians, and a little while ago I also got the smaller but similar Taschen Circus book as well. Both of these subjects are fascinating to me, and both of them are chock full of interesting things one can pursue as a person who makes images. Whether it be through screen-printing, collage-making, or my more standard ink-drawing, there’s stuff there. So it kind of fell into place on Sunday when at one of the first booths i stopped at at Renninger’s, I found this terrific Columbia record set of 78s called, simply, “Circus.” It’s performed by the Ringling Bros Barnum and Bailey band, and it’s nearly new condition even though it’s likely fifty years old. I am one of the few people I know who has a turntable and one of the fewer whose turntable plays 78s, so the asking price of $5 was a no-brainer. The cover art alone was worth that. The next thing that caught my attention was a poster at another booth for a Shrine Circus that was apparently held from April 6 to April 11. I don’t know what year, but it wasn’t recently. I skipped this at first, thinking I didn’t want to go crazy with circus stuff. 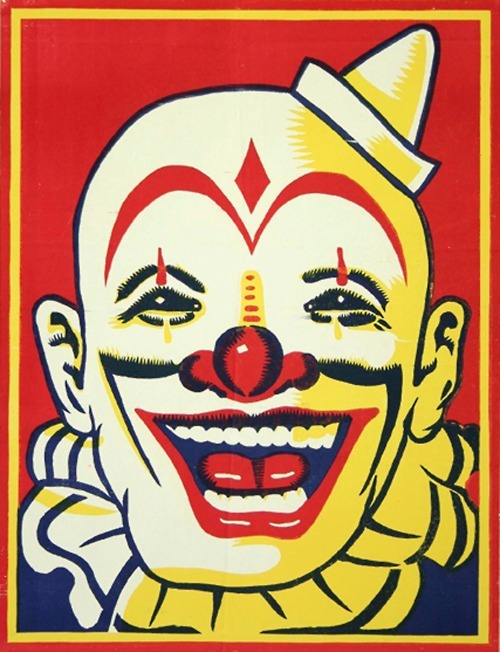 But not five minutes later I saw yet another circus poster that was as good as the first one. For the same reason, I passed on this one too, but once I found the second Circus music album soon after this, I knew I’d be back for the posters. The second album is a more mundane 33 1/3 LP, but once again the cover art is what forced me to grab and go. I love this crazy clown. I don’t know who is Merle Evans, and the Everest label seems to be somewhat lost to obscurity. But like the Columbia collection, it’s in perfect condition, and did I say how much I like that clown? So clowns. Elephants. Monkeys. Trapeze people. Not the Cirque de Soleil kind but the classic Ringling kind, and even better, the somewhat scary European kind. It’s fodder for the imagination. In March 1985, I made one of the more pivotal decisions in my life, which was to attend a summer high school program at Parsons School of Design in New York City. I was sitting in my art class in high school, in Pasadena Texas, and up on the wall, above the chalkboard, was a poster depicting a huge apple*. The program was four weeks long and offered courses in Illustration, Communication Design, Fashion, Photography, Fine Arts, and probably other studies. When I told my mother, who had never been to NY and was from small town Arkansas that I wanted to do this, I don’t remember her having a nervous breakdown but now, 27 years later, and being a parent of two kids of my own, I’m sure she had one. Seventeen years old, four weeks in New York City. Luckily, mom was pretty good at saying okay to crazy schemes and somehow the application got filled out, financial aid was applied for, and in late June of that summer I climbed on a plane at Houston Intercontinental Airport and headed off by myself to LaGuardia. I took with me my sister’s Pentax K1000 and several rolls of film. I knew nothing about photography, and knew less about f-stops. So it made sense that I ended up in NY with a fully manual SLR camera. Little did I know that in addition to the design stuff I learned, this four weeks turned me on to a lifelong love of taking pictures. Upon arriving in NY, I stood at the taxi stand and tried to figure out what to do. I was standing there with a duffle bag and a portfolio case, and I suppose it was obvious that I was an art student because I heard a voice over my shoulder ask “are you going to Parsons?” Next to me stood the second most fashionable sophisticated-looking girl I’d ever met in my life (I’d meet many more of these boys and girls over the next few days). She’d also just got off a plane, was also attending the summer program, and apparently knew what to do because she got a cab, put us in it, and we headed off to Union Square, where Parsons had a dorm (there’s a restaurant there now called the Blue Water Grill, in case you know the area). We paid the cabbie (I felt like I was on a tv show) stepped out onto the street. I looked to my left, down Union Square West and University Place, and for the rest of my life I’ll never forget seeing those two towers poking out between other downtown buildings. The next afternoon I went down and stood on the Union Square sidewalk and took a picture. A week later, on July 4, I went to the top. The story of that full four weeks is a much longer story, but it goes without saying that it opened doors and showed me a path that I would otherwise never have known about. It should also go without saying that I made a beeline for both the Empire State Building and The World Trade Center, making my way to the top, and taking a lot of pictures. I just figured today would be a good day to post a few of these. *I believe the reverse side of the poster had a huge orange, and focused on the programs offered at Otis/Parsons in Los Angeles (which is now just Otis). A screen-grab rom the HarperCollins author search page. I hope no one gets us mixed up. A couple of photos taken with the phone while walking the dog last week. Cold and sunny. I’m often surprised how my telephone and $2 app software can create photos that feel more organic and analog than any expensive dSLR I own. This is pretty great, and I don’t care who the narrator really is. I awoke this morning to news that Ronald Searle passed away yesterday. Back in college, around 1988-90, Ronald Searle traded blows with Edward Gorey for my affections. Searle represented the loose, luscious line work and bawdy observations that I was attracted to on one hand (but secretly so, since I was such a prude back then and Searle’s subject matter was often a little, how do you say, naughty), while Gorey represented a precise and obsessed drawing style, and the more macabre side of my sensitivities. Gorey eventually got the upper hand when I wrote and drew Frederick & Eloise, but even then, I had Searle’s book Ah Yes, I Remember it Well: Paris 1961 – 1975 with me while living on Place Pigalle in 1991 and referred to it often. I haven’t thought about Searle in some time, and I have no idea what happened to that book. Other inspirations and influences have come and gone and you’d be hard-pressed to find that dripping quill-line ink and robust sensuousness in anything I’ve drawn in the last ten years. I think maybe I’ll go find a used copy of that book, or else his Paris Sketchbook, and live in the past for a few hours. I just thought the comparison was funny. I’ve been away from the studio and running around Northwest Oregon with my family for the last week. We’ve been standing on windy beaches and hiking up volcanoes as Philadelphia experiences an earthquake and now braces for an oncoming hurricane. Go figure! Something I’ve noticed about vacations for me over the last few years is that I’ve not much interest in drawing while I’m on them. In the past I’d take watercolors and brushes and inks on trips, and make time to sit and stare at cathedrals and mountains and boats while I record these sights into a sketchbook. Lately, however, I’m loathe to break out the journal or anything more than making packing lists or travel notes; and I’m much happier to play around on the ukulele or read or merely look out a window than draw. I figure this could be due to the fact that for the last five years I do nothing but draw while I’m at work, while in the past I also taught and did graphic design among other tasks. Furthermore I’m working on these very dense, heavily detailed Everything Goes books right now which, as fun as they are, is real work and taking a break from working means taking a break from drawing. It could also be that now I’m traveling with kids. That doesn’t hold up, however, since even when Sacha and travel together sans little-Biggses I still don’t want to draw pictures. In any case, I do love taking pictures of the places we go and the things that we do. So rather than sketches of my journeys, I’ll share a few photos. Wilson and Elliot getting their feet wet in the Pacific for the first time at Haystack Rock in Cannon Beach, Oregon. A seagull on Cannon Beach. Hiking to Smugglers Cove, just north of Manzanita, Oregon. Huge driftwood trunks on the beach just north of Manzanita, Oregon. The beach at Smugglers Cove. Surfers on the beach at Smugglers Cove. My daughter Elliot paddle-boarding at Hood River, Oregon. Looking up at Mt. Hood. Taking the Magic Mile up high on Mt Hood from Timberline Lodge. More to come. Enjoy the hurricane.